FRANKLIN LAKES, N.J., Oct. 17, 2018 /PRNewswire/ -- BD (Becton, Dickinson and Company) (NYSE: BDX), a leading global medical technology company, today announced a donation of 20 million syringes valued at $1 million to Rotary, a nonprofit organization dedicated to tackling the world's most pressing humanitarian challenges, in support of the Global Polio Eradication Initiative. 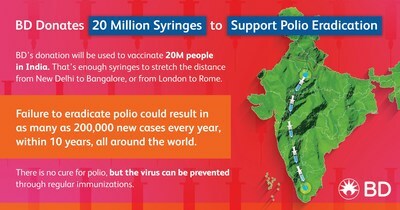 With facilitation by Direct Relief, a global humanitarian aid organization, the 20 million syringes will be delivered and used for vaccinations in four states within India — Maharashtra, West Bengal, Tamil Nadu and Haryana — towards the goal of sustaining polio eradication in India, which was first achieved in 2014. If put end-to-end, 20 million syringes would nearly stretch from New Delhi to Bangalore, a distance that exceeds the span from London to Rome. "Rotary has been one of the leaders in the global effort to eradicate polio for years, and with this donation, BD is linking back to the contribution the company made many years ago to the original polio eradication effort in the U.S.," said Gary Cohen, executive vice president of Global Health at BD and president of the BD Foundation. For more information about this program and other global health priorities at BD, visit bd.com.